ClickBank Superstar review - Scam or legit? TRUTH EXPOSED here! Home > Online opportunities > ClickBank Superstar review – Scam or legit? TRUTH EXPOSED here! Welcome to this honest ClickBank Superstar review! Are you wondering if cbsuperstar.com is a legit program that can help you make thousands of dollars with ClickBank? Or will John Thornhill scam you out of your hard-earned money? If that’s what you are wondering, I’m glad that you have landed on this post because here you will find the complete truth about this program. First of all, congratulations on doing your own research before making a purchase. There are too many frauds out there, so doing your due diligence is what you can do to avoid scams and discover the legitimate way to earn a substantial income online! When it comes to ClickBank Superstar, it’s a little bit different than many of the ClickBank products I have reviewed, and here you will learn why. By the end, you will know if this is a good fit for you or not, so keep reading! 1 What is ClickBank Superstar about? 3 Is ClickBank Superstar a scam? What is ClickBank Superstar about? Someone sent me an email concerning ClickBank Superstar, so I thought I would check it out to see if this one would be worth it or just another scam to avoid. The moment I saw the sales page, I thought this program wouldn’t be like other ClickBank products I have reviewed because the sales page looked different than the others. The sales page for ClickBank Superstar is not full of misleading claims or hype about making thousands of dollars quickly or easily, which is a good indication. 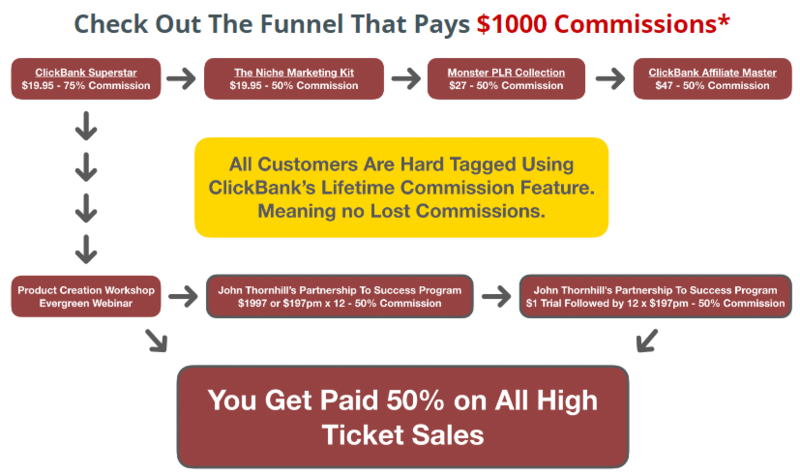 This program was created by John Thornhill, who has been making money with ClickBank since 2005, so he already has a lot of experience and knows his stuff. From everything I’ve seen on the sales page, I believe he’s making the kind of money he’s talking about. In the sales video, he says that it’s important for Internet marketers and business owners not to put all their eggs in one basket, which I agree. With ClickBank Superstar, he will be teaching you how to sell products on ClickBank as a vendor. This is something that has been working for years, so it’s nothing new. The concept is quite simple to understand: you create a digital product and use ClickBank to sell it. Also, I like the fact that he’s not marketing this product as a secret system or new method. Instead, he’s being straightforward about what this is about, which is something that most products I review are not transparent about. When it comes to ClickBank, it has existed since 1997/1998, which is a good sign because the longer a platform has been out there, the more trusted it is. It’s an online marketplace that allows you to make money in two ways: selling your own products as a vendor or selling other people’s products as an affiliate. Whether you are an affiliate or are selling products on other online marketplaces like JVZoo or WarriorPlus, I believe you can benefit from ClickBank Superstar if you are looking to add a new income stream to your online business. You see, there are lots of affiliates on ClickBank who are looking for offers to promote and earn commissions from, so there’s a lot of income potential because the more affiliates who promote your products, the more money you can make. Like I said, ClickBank Superstar works by teaching you how to use ClickBank to get your products in front of thousands of affiliates, who will help you get potential customers to your offers and generate sales. 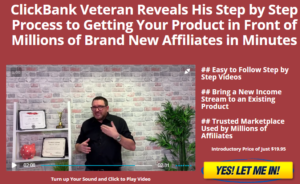 Inside the members area you will find PDF guides and step-by-step video training about what you need to do from getting started to getting affiliates to promote your products and making sales. Affiliates usually earn 50% commissions for each sale they make, but you will also learn how they can make 100% commissions. For example, if your product costs $37, the commission rate is 50% and an affiliate makes a sale, the affiliate will earn $18.50 and you will keep the other $18.50. Note that you will also have to pay your ClickBank selling fees. The thing is, the higher the commission rate is a.k.a. the more money affiliates can make, the more affiliates who will promote your products, so this is a way to increase your earnings. I mean, you cannot only rely on ClickBank to get traffic to your products. The more traffic sources you have, the better. But it’s best that you start with one and master it. The training provided only covers basic stuff on each traffic source, so depending on which one you choose, you will have to look for information elsewhere. In case you have never created a product, there’s a product creation workshop within the members area, which will help you create your first product step-by-step. The training provided completely works so you can really make money if you apply what you learn. But there’s no guarantee that you will make the kind of money that John shows. Not only that, some of the information can also be found for free online. I guess that getting everything together is great if you want to save some research time. According to the sales page, ClickBank Superstar costs $19.95. But don’t you think it’s way too cheap considering everything you are getting? Well, the truth is that just after making the $19.95 initial payment, you will be bombarded with some upsells that cost thousands of dollars. This is what happens with most (not to say all) ClickBank products, and this one is no different. As you can observe above, if you promote it as an affiliate you can earn 50% for each sale. If people purchase the Partnership To Success Program through your affiliate link, you can end up earning $1000 or even more in total. Sounds great? Therefore, spending $19.95 will not give you everything you need to make this business profitable. You need to be wiling to spend over $2K if you are really serious about this. This is something you can also do with your own products. You will learn how to add upsells & downsells to your sales funnel so that you can profit the most. With that said, it’s important that you make sure your products are valuable and relevant to your audience because that’s the way you will keep the customers. Also, when your products are helpful to your customers, you will have a low refund rate. You see, refunds can make you lose money, especially if you have spent money to get traffic to your products. So it’s important that your products meet your customers needs. Unlike other ClickBank products, ClickBank Superstar is transparent about the person who has created it and the testimonials. Many of the ClickBank products that I have reviewed use pen names or have fake characters instead of being honest about its owners. Products that don’t reveal the people who have created them tend to be scams, so the fact that this is not the case with ClickBank Superstar is a good sign. Another good sign is the fact that the testimonials are real, which is something that many ClickBank products fake. They usually have invented comments with pictures taken from other sites or fake video testimonials. Therefore, I’m glad that ClickBank Superstar is transparent about things that many other products lie about. Is ClickBank Superstar a scam? No, ClickBank Superstar is not a scam, it’s a legitimate program. The reason it’s not a scam is that you receive good training that can help you make money by selling products on ClickBank. If you are already an Internet marketer who’s selling products on other marketplaces, then I believe you can benefit from ClickBank Superstar because you will learn to add another income stream. In case you are someone who has an idea for a digital product, I believe you can also benefit from ClickBank Superstar because you will learn to create digital products. Also, if you are an affiliate who wants to become a vendor or product creator, you can benefit from it as well. Therefore, I don’t mind recommending ClickBank Superstar (get it here) because I believe it’s a legit program that can benefit some people. With that said, if you are the kind of person who’s on a low budget, I don’t recommend this product to you because it will require you to make a big investment. Even though I’m not a product creator, I make passive income every single day with affiliate marketing. As an affiliate marketer, I don’t need to spend any time or money on creating products, so I believe this business model is better for people who are looking to get started. Also, I don’t need to spend any money to get traffic to my site! Yes, I didn’t have to spend thousands of dollars to start making money. Sounds cool? There are many people who didn’t have any previous experience or special skills when they got started, and they have still managed to earn a full-time income. Affiliate marketing has been working for many years and it’s only getting better because more and more products are coming out every day. Oh, and did I tell you that you can get started today for free? Thanks to my favorite platform that I reveal in my guide, you will be able to make sure this business is right for you without spending a dime! I hope this ClickBank Superstar review has been helpful to you and you will make the best possible decision. 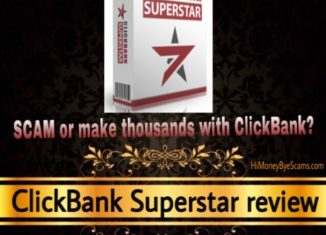 I have read the whole review about ”ClickBank Superstar Review – Scam Or Legit?”TRUTH EXPOSED Here! Thank you very much for your honest review On ”Clickbank Superstar” with all the necessary information.Really this is an amazing review.I was little familiar with clickbank superstar.Before reading this review I thought that the clickbank superstar was a scam but your review has opened my eyes.Now i realize that clickbank superstar is a legitimate program.This is a very helpful and informative review for those people who want to know perfectly about clickbank superstar.But is it suitable for newbie? I will share this informative review with my friends and relatives so That they can learn perfectly about clickbank Superstar. RetailPay.org SCAM – Review exposes their LIES and FAKE CLAIMS! Is Ripple Code a scam? The truth in this review! BannerBit.com review – Is Banner Bit a scam?